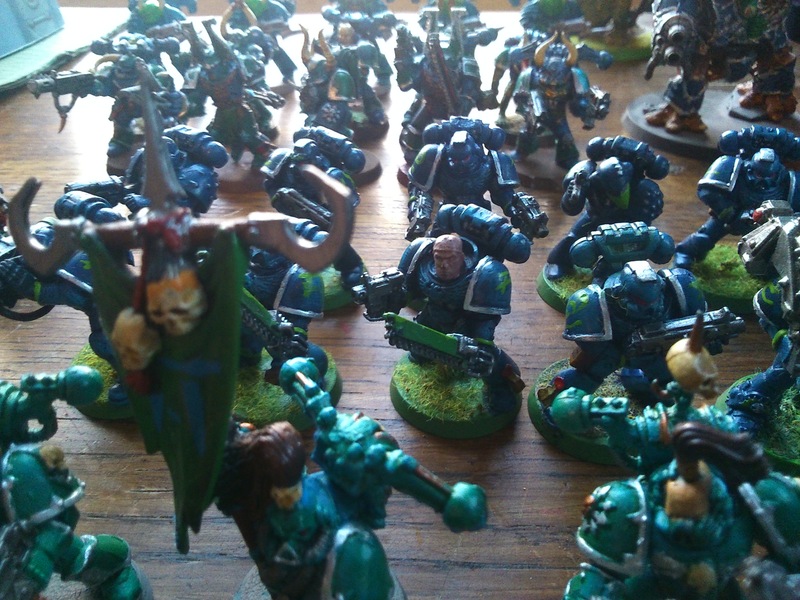 The Alpha Legion warband of Thorfinn The Bloody Furious. 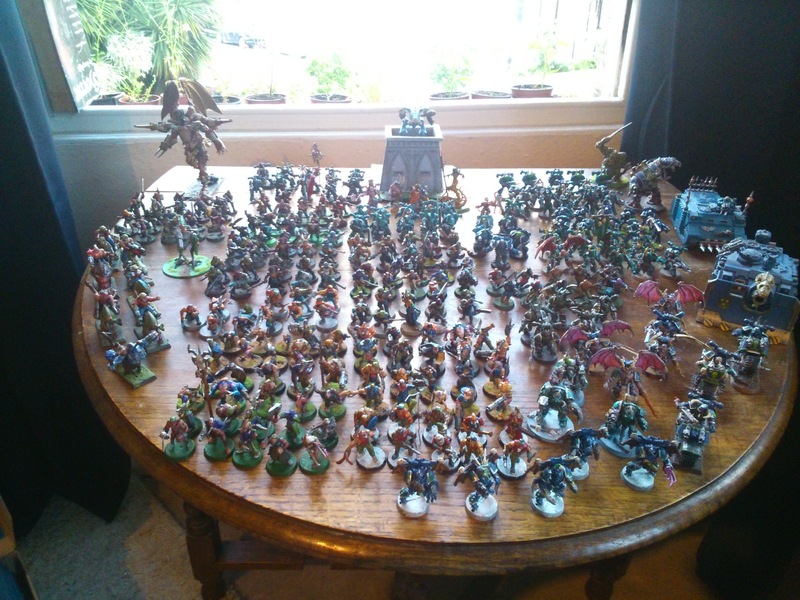 The next twenty or so photos show off this army in its completeness. I’m pretty pleased with it, but there are some problems. First of all, and most obviously, quality control. 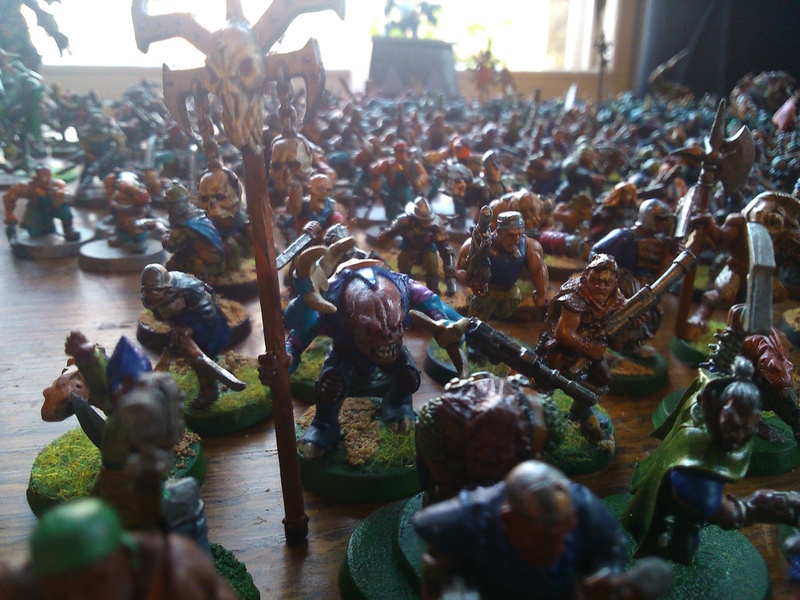 Included in this army are many of the earliest miniatures I ever painted and so the quality of painting is simply pretty low (even by my standards). 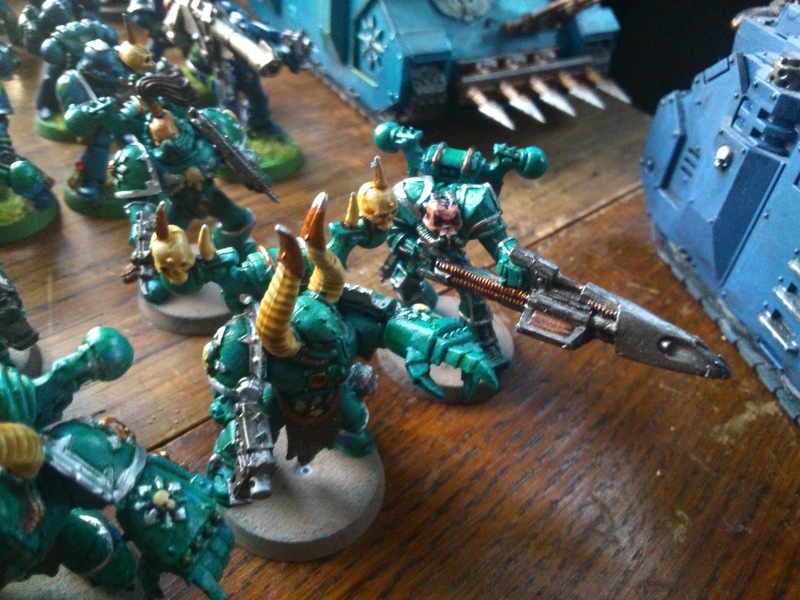 Secondly, I never found an Alpha Legion colour-scheme that I was entirely satisfied with, so there are lots of variations on blue-with-green-and-silver-trim. 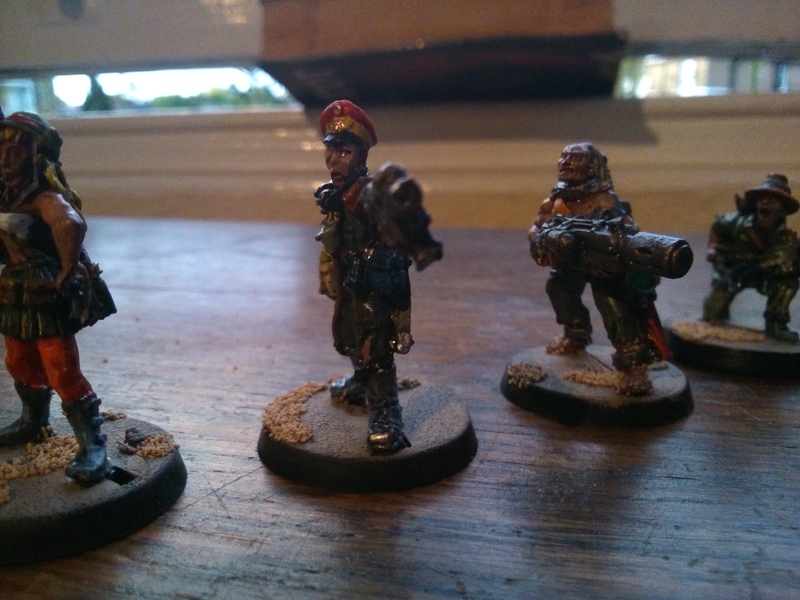 Thirdly, the style of the cultists is all over the shop. 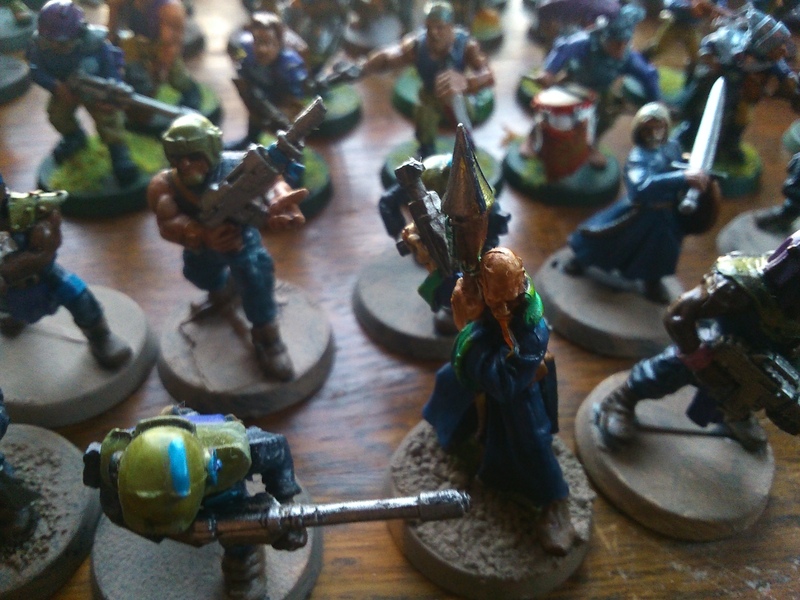 Early in my painting hobby I liked the idea of the cultist gangs being a mix of soldiers, civilians, mutants, human chaos champions and magicians, etc etc. 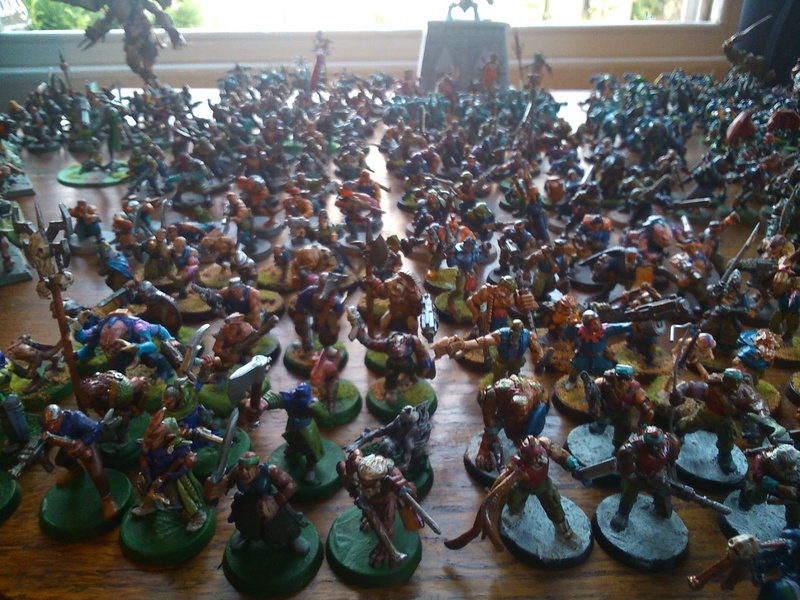 So basically it was a bit of an anything goes, lots of fantasy miniatures with guns. Later on I decided that this style wasn’t really working and so the cultists became a bit more themed, with only the odd mutation here and there. Less talk and more pictures. At 6th ed. prices there’s just over 4000 points here. HYDRA DOMINATUS! 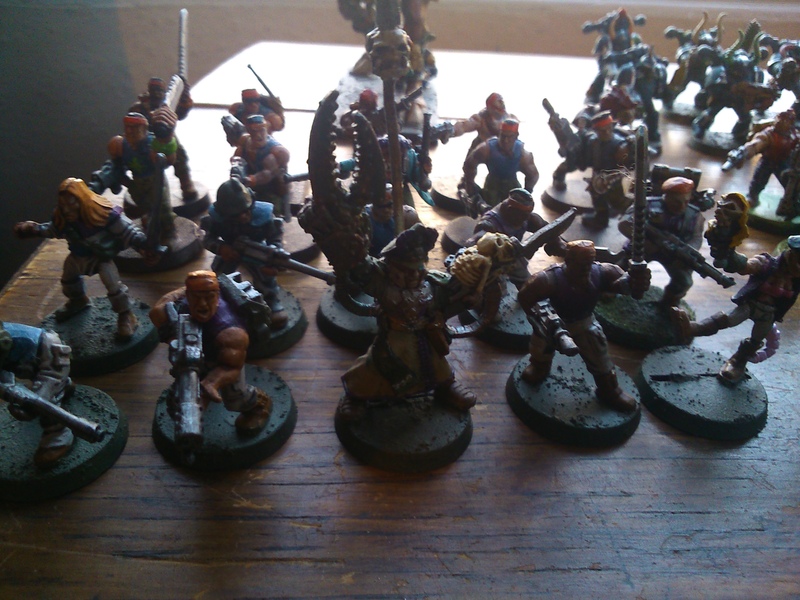 The whole army – mutants and assault squads to the front, cultists next, then CSMs, with the bosses and the artillery at the back. Tsunami of mutants! 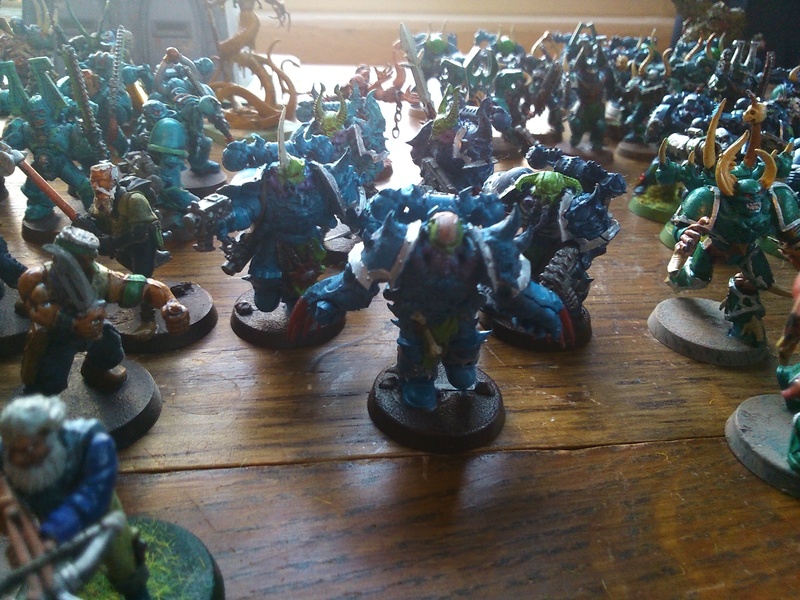 The eagle-eyed might spot a genestealer hybrid in there. 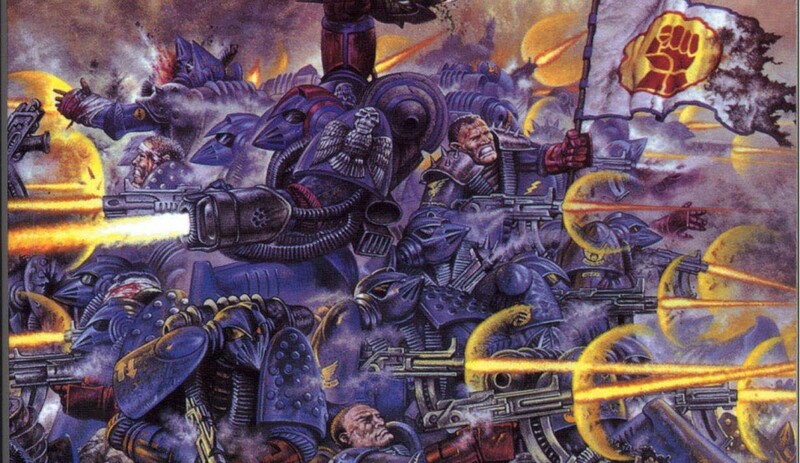 CSM Assault! 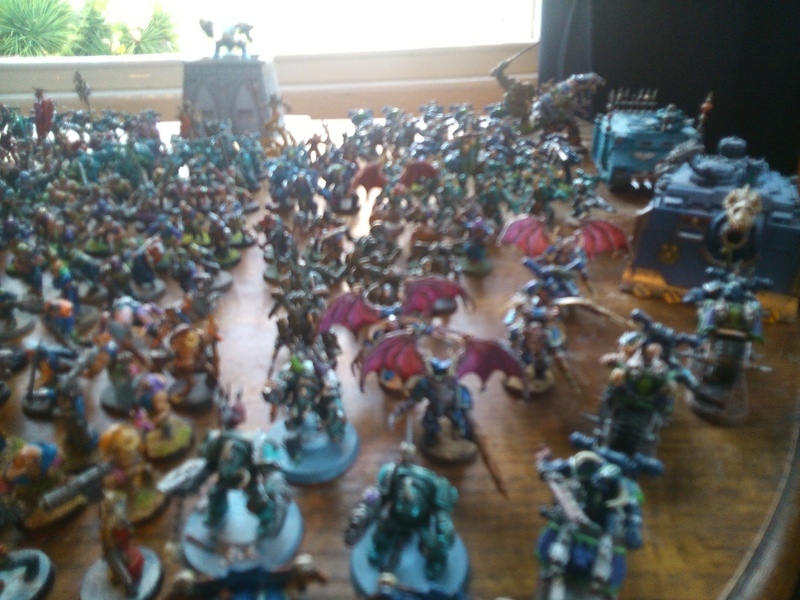 Chaos Terminators, Chaos bikers, and loads of (incredibly hard to paint) Possessed Chaos Space Marines. 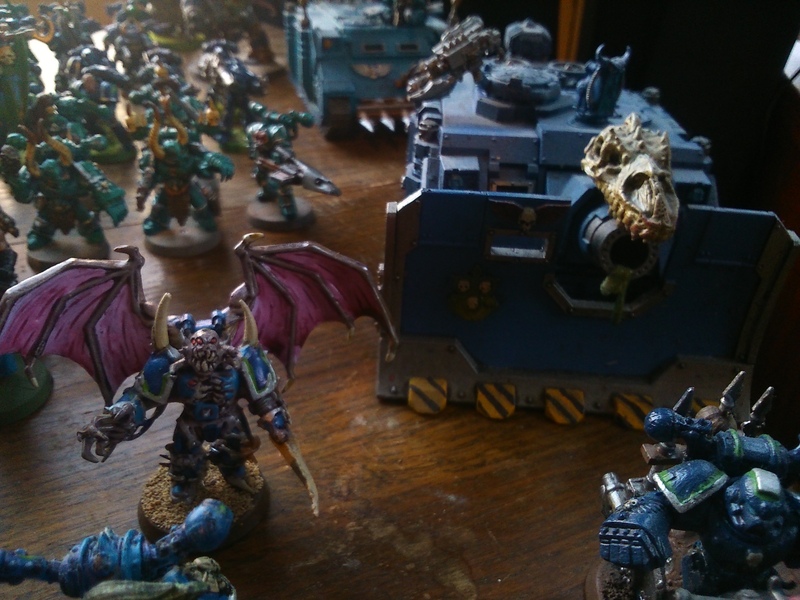 I’m also very pleased with the Vindicator with it’s dragon skull on the barrel. Chaos Rough Riders! My first conversion work, very rough but you gots to learn somewhere. 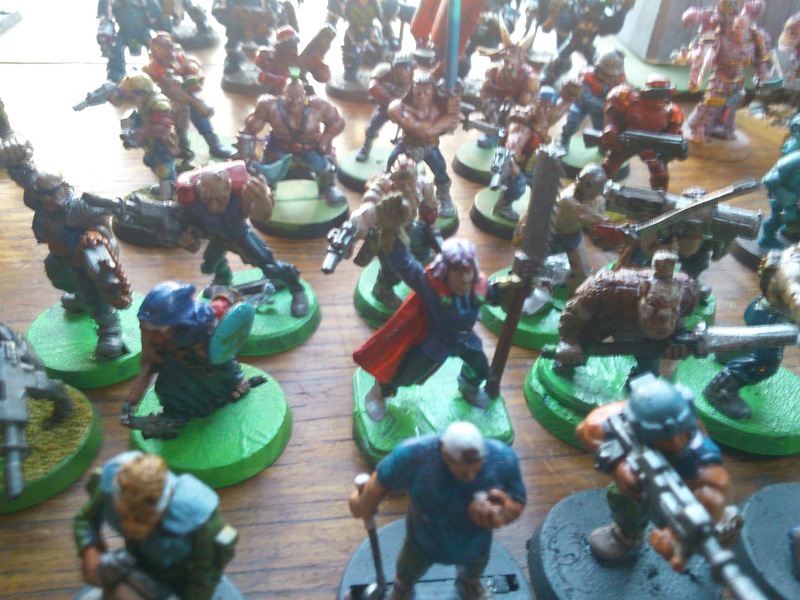 Frenzied Mutant Mob! You can see how I just threw everything in there. I’ve now decided that if I’ve got a couple of e.g. Dark Elves they can be part of a ROC warband rather than shoehorned into a 40k one. Possessed and Vindicator. Both are very differently challenging models to paint. 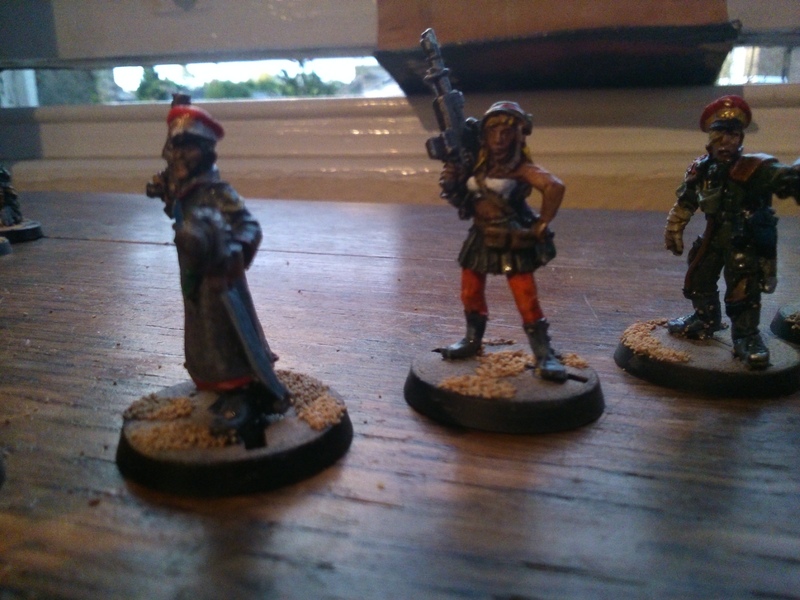 A dastardly psyker and his cultist retinue. A Sentinal, piloted by a crazed cultist. I love these egg-walkers! 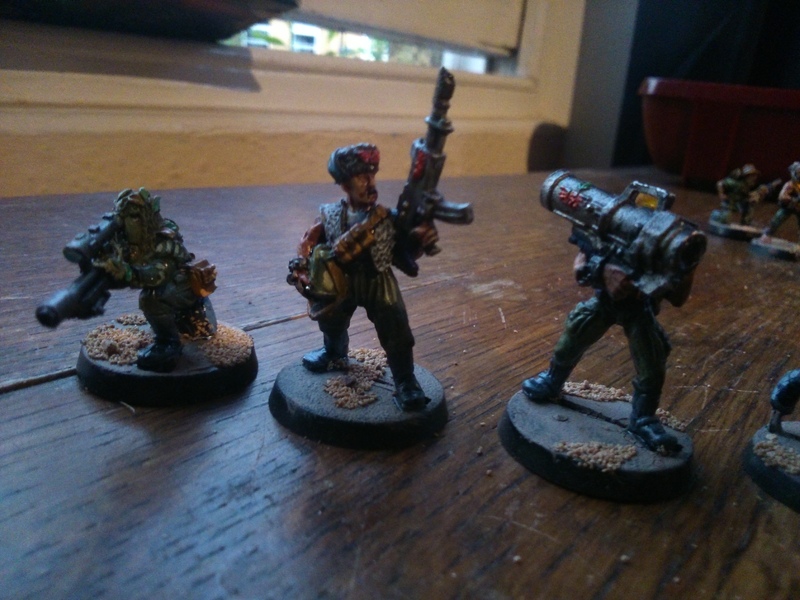 A commissar has turned to chaos. 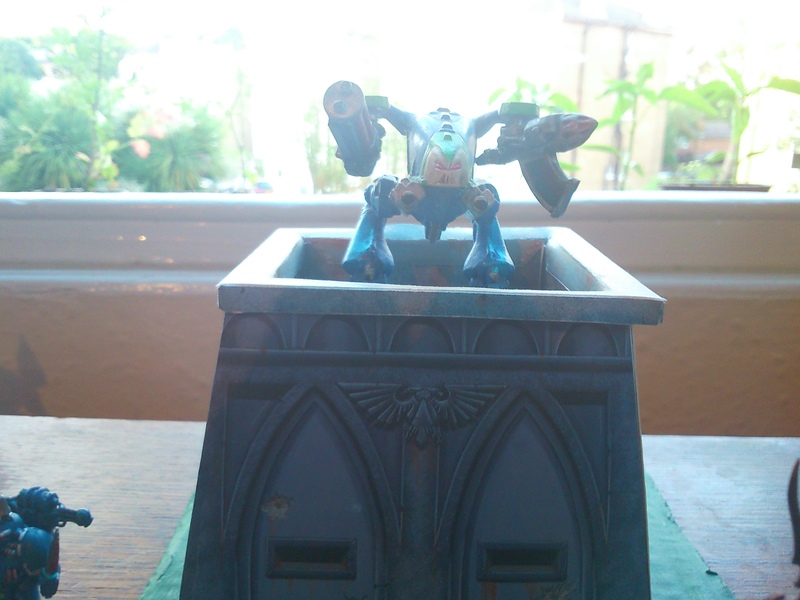 Oh such heresy! 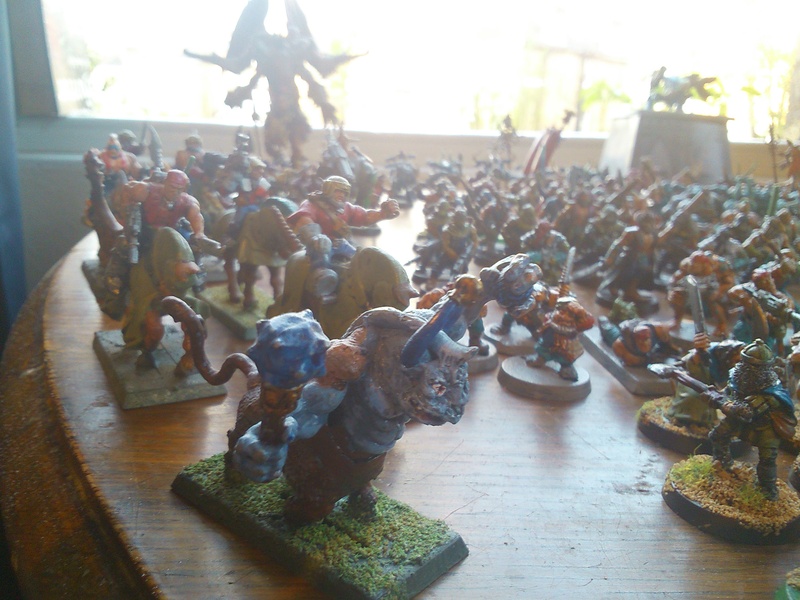 His quad include an Heroquest elf and a Blood Bowl Chaos Cheerleader! 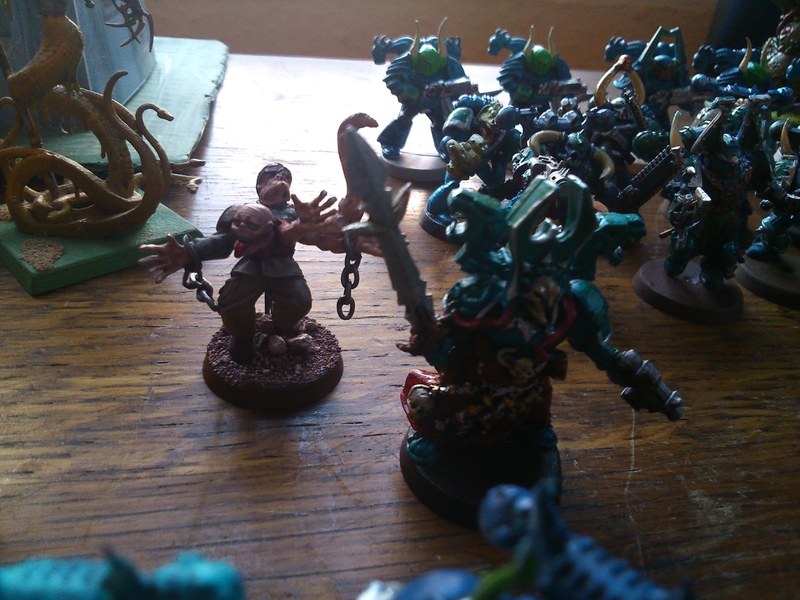 Another Chaos Sorcerer and his bodyguard of foolish cultists. 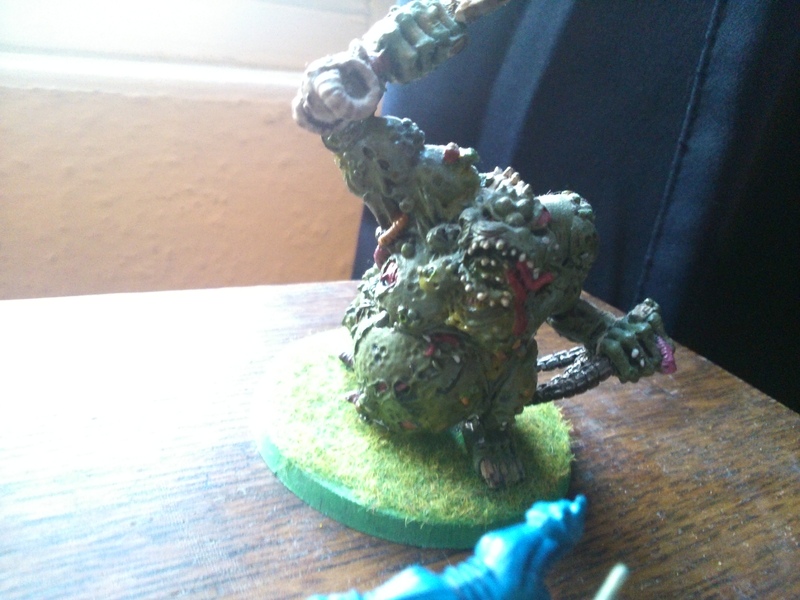 Uncle PusHugs, my Great Unclean One. Big Moo. 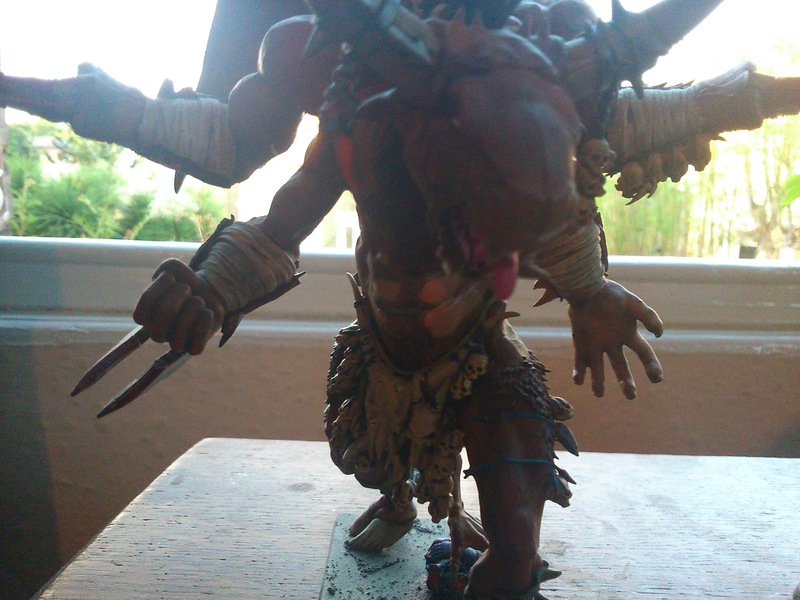 Big Moo is a Chaos Spawn, made huge and idiotic and deadly by the warping power of chaos. I really liked painting and converting this model. The Bosses: Muriel The Cancerous, Great Megarhyssa, Thorfinn, and the Slimequeen. 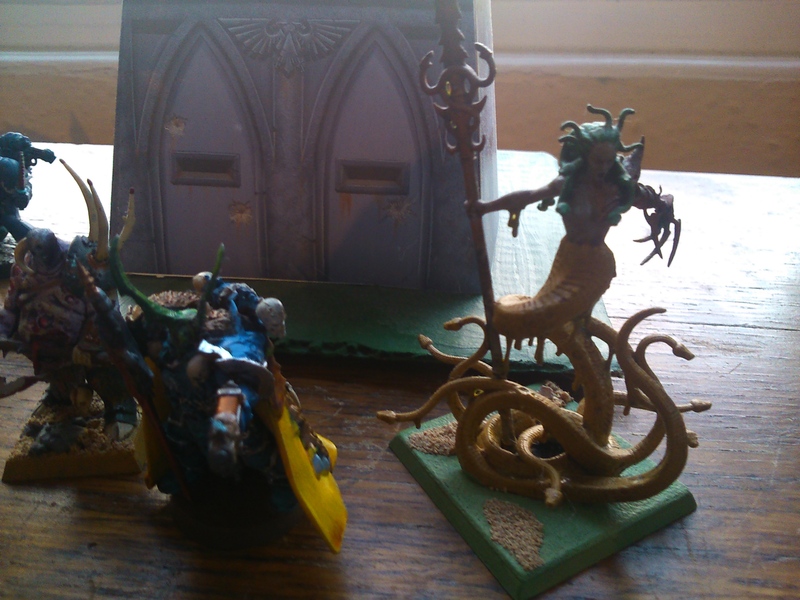 Thorfinn and the Slimequeen, beloved of Nurgle! 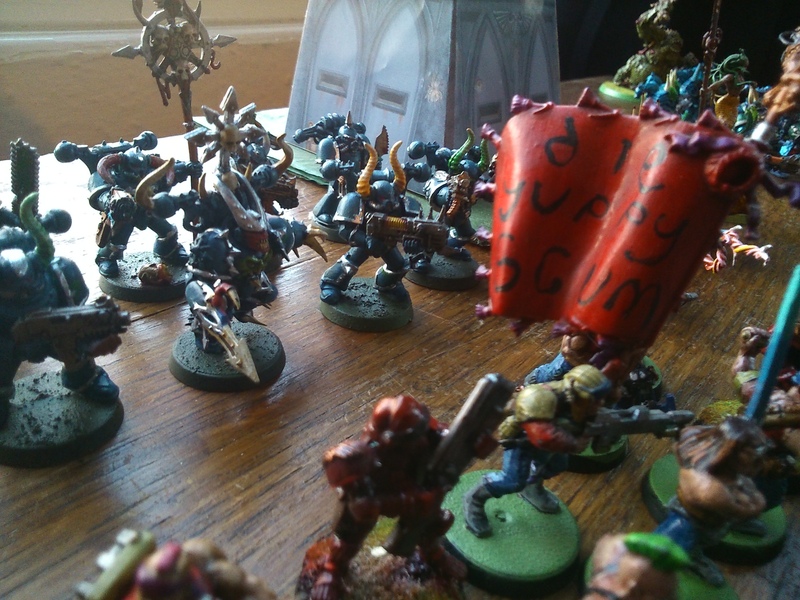 The bunker behind is a card Battle Bunker from White Dwarf magazine in about 1994. Mark IV Chaos Dreadnought. 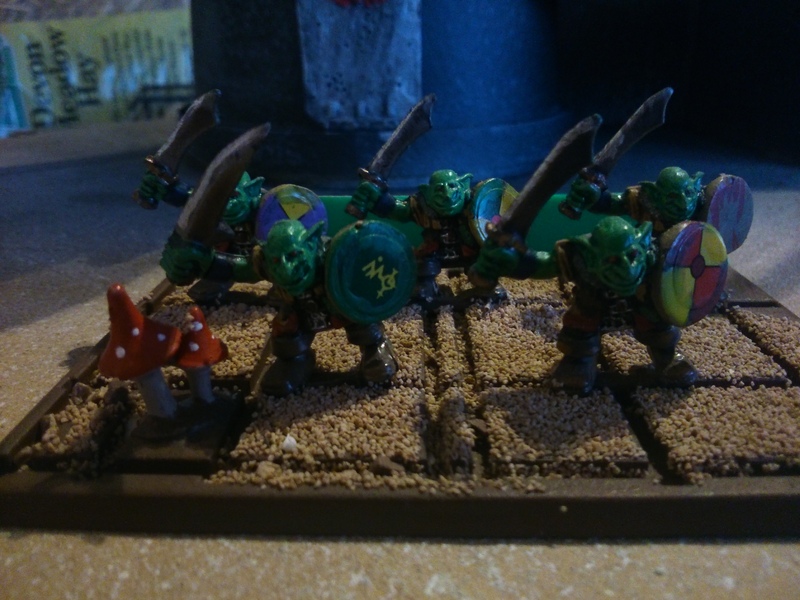 One of the first miniatures I painted! Chaos Sorcerer Magdi and his familiar Vissel The Possessed. Confession time, Vissel is a conversion that came in a lot I bought on ebay and i liked him so much I didn’t touch him. 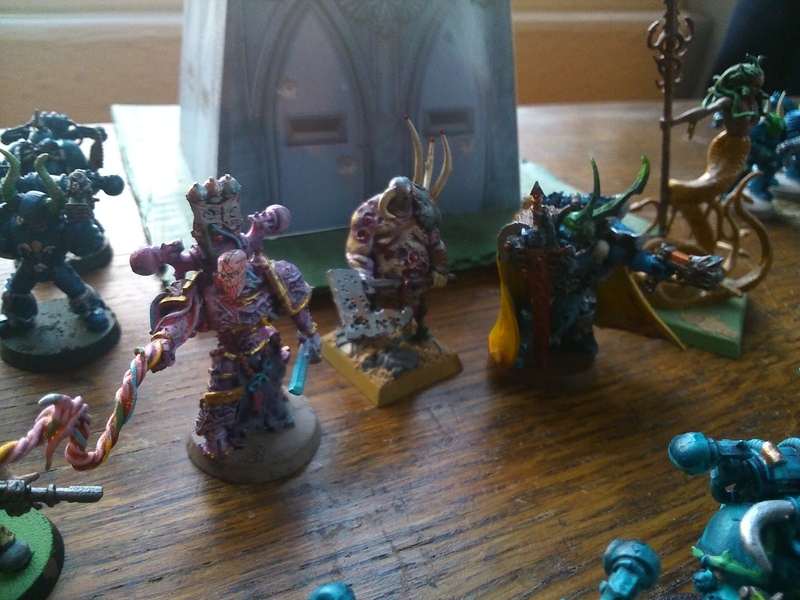 More Chaos Space Marines. 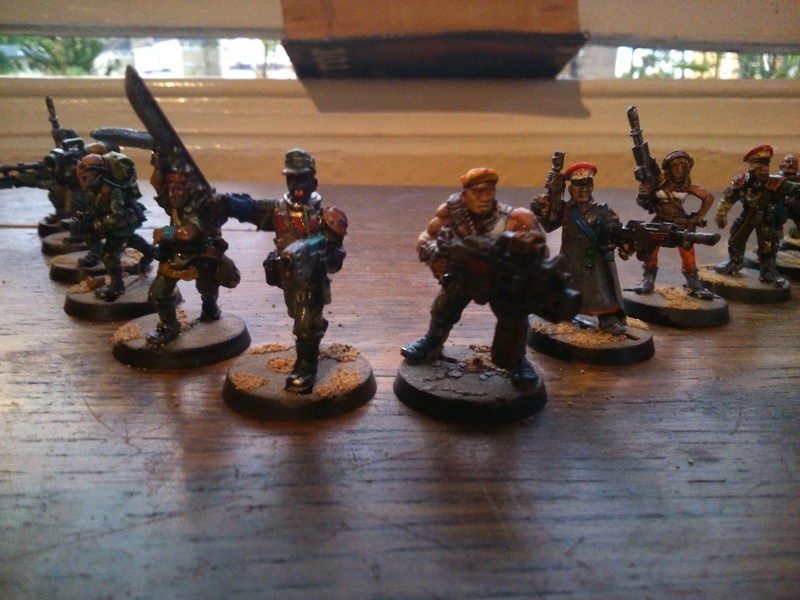 I love the early Rogue Trader Renegades and in the next army am going to try and increase the ratio of early CSMs to modern ones. CSM Chosen from the Dark Vengeance box-set. 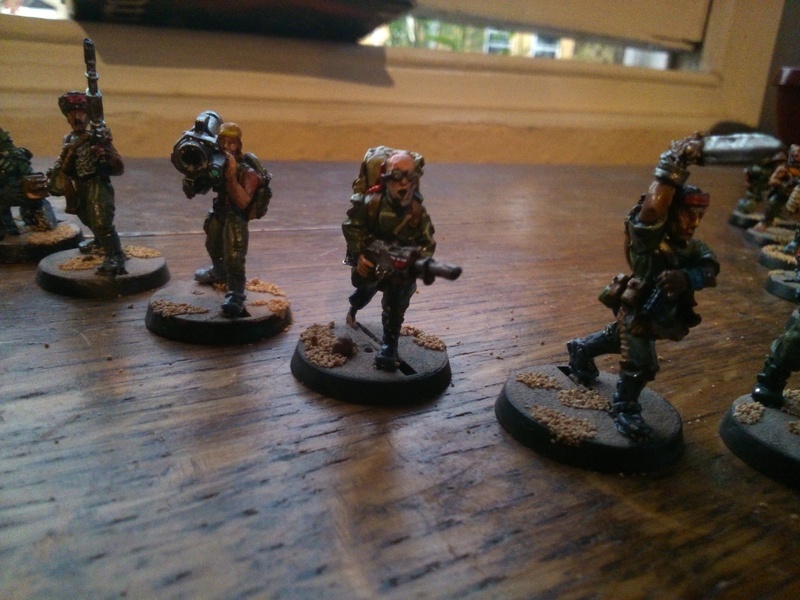 Fantastic models but this is a shonky paintjob.